I just like the idea of using the garage because it’s going to be dead space otherwise. I don’t really have a lot of possessions to need to store in there as I live in my own. It’s pretty roomy in there as well. Tbf the cheap bottled water idea is a good one. I’ll find a way to make it work. Yeah I know, but having a hose leading down the alley from my house to the garage is another level of attention I could avoid. Finally done my NEIPA. Just waiting for it to cool to 80C before hoying 200g of hops in. Further 200g for the dry hop anarl. Wort looks nice and cloudy. Tees Exile and PTR like this. Anyone recommend me a really lush wheatbeer kit? Not my cup of tea but looking on one of the brewing forums, Brewferm Tarwebier is recommended by one person. Also, a few have tweaked the Wilko kit. Champion I’ll have a butchers. Did a kit over summer from Brew Masters before they went under: amazing. Höegaarden clone. Pimped it with some oranges in the fv for 2 weeks before bottling. Lusharoon etc. I made a Blue Moon clone once, that had orange peel and coriander seeds in the recipe. Kegged NEIPA and also got four bottles extra. I need bottles to put 40 pints of ipa in but the cost of buying in wilkos itd be cheaper going out for 40 pints! I've got a load of bottles you can have mate. Loads of them have been in that I've been meaning to chuck out, but you're welcome to have a try of it. Even got crates you can put them in. 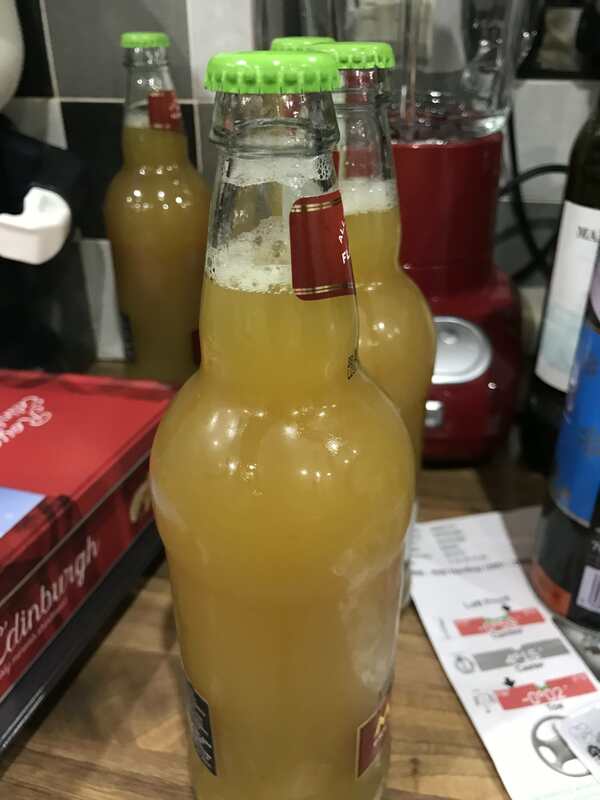 I made around 60 litres of cider and Perry from from I collected in the autumn and put them into 2 litre plastic pop bottles. It seemed to work alright. pillars of hercules and PTR like this. I started making wine last March with a load of rhubarb I had frozen to clear some space. It tasted like paint stripper when I first tasted it and put it to the back of the garage. I've made a load more (different) wine since which tasted much nicer. I had a mouthful of the first one a couple of weeks ago and it's changed completely. Bloody lovely and very very strong .